The Building Envelope page describes the part played by a high-performing building envelope and includes a video commenting on the framing design and insulation. The construction of the walls (and roof) significantly influences the thermal performance of the building. This has an effect on both our comfort and the ability to achieve the goal of not heating the house as the more energy that escapes through the walls, the more energy must be introduced into the building to maintain the target temperature range. Most New Zealand homes need a heating system to provide enough energy to keep the house warm. The insulation levels in the Zero Energy House mean that target temperatures can be maintained primarily by the energy from the sun, but also from day-to-day living (heat from occupants and electrical loads such as lighting and cooking). We sought to identify a practical, highly-insulated solution to wall construction that provided an alternative to the standard 90mm framing used in most New Zealand homes. The insulation value (R value) of a wall is primarily a function of the R value of the insulation material and the percentage of framing in the wall. Standard 90mm framing with nogs has about 16% thermal bridging from the studs and nogs, meaning that heat can escape from the building through these points. Some of the options considered are shown below. Click each to view a larger image. External battening, 90mm stud, no nogs. 140mm studs, 90 nogs, external 35mm insulated sarking board. Internal battening, 90mm stud, 90mm nogs. We removed the nogs from between the studs and replaced them with supporting battens that ran along the inside of the wall. The solution we arrived at was to remove the nogs from between the studs and replace them with supporting battens that run along the inside of the wall. The same approach is taken in the ceiling. Reduced thermal bridging. Removing the nogs allowed us to run uninterrupted insulation the full height of each floor between the studs. With standard framing, panels of insulation are placed between each nog, with each nog acting as a thermal bridge. Taking out the nogs reduced this bridging effect, thus increasing the insulation properties of the walls. A second insulation layer. With supporting battens on the inside of the walls and ceiling, a space was created between the battens to run a second layer of insulation. This not only provided a thicker overall insulation layer, it also laid insulation over the studs - which reduced the thermal bridging effect even more. Another benefit of this framing method is that it created an internal wiring and plumbing cavity which allowed quicker installation of those components as they could be laid outside of the studs rather than having to be drilled through. This wall design and double layer of insulation enabled a 50% increase in performance above building code. Insulation is critical to building performance and the health of homeowners. However, it's important to understand that the insulation required in the building code is a minimum specification; you can install much more than that. At the Zero Energy House, the reduction in thermal bridging and use of double insulation layers have enabled us to achieve a 50% increase in performance above building code. When we considered the cost of heating the home for 25 years, a little more insulation certainly seemed worth it. The insulation product used is important. It needs to be able to last the distance, and also be healthy to both install and live with. 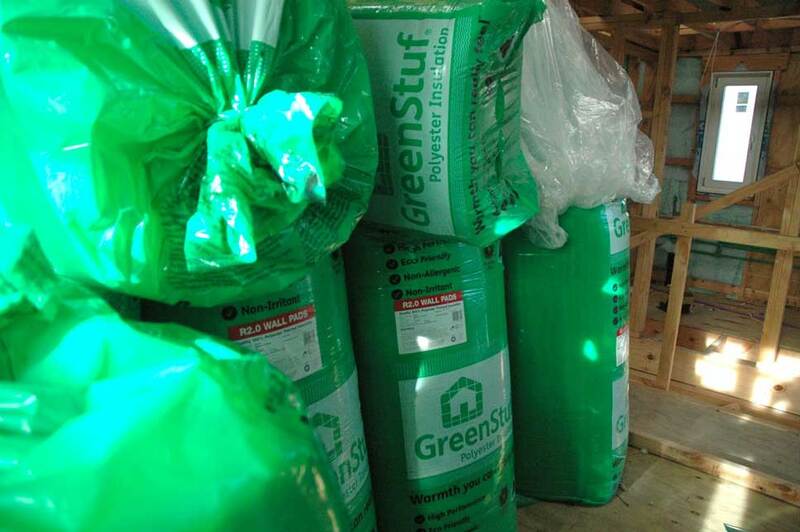 All of our insulation is GreenStuf. The insulation plays a big role in keeping heat in the home, helping avoid the need for heating. We chose GreenStuf because of its durability and material benefits. It's warrantied for 50 years, is made from polyester fibres instead of fibreglass, and is bonded using heat instead of chemicals. It is extremely durable and comes with a 50 year warranty. It's made from 100% polyester fibre instead of fibreglass, and is bonded using heat instead of traditional chemical binders. This makes it non-toxic, non-irritating, and non-allergenic, which is better both during installation and after we moved in. It contains a minimum of 45% recycled polyester fibre made from used and recycled PET bottle flakes. The polyester fibres are fully recyclable at the end of the product's life. It doesn’t absorb moisture so doesn’t need any treatment during manufacturing to keep moisture out. There are no issues with wiring around it, compared with polystyrene insulation. With the help of friends and family, we installed the GreenStuf product ourselves over a few weekends. It's really important to make sure when installing that there are no gaps between panels. Even a 10mm gap can have a big impact on the performance of your building envelope. 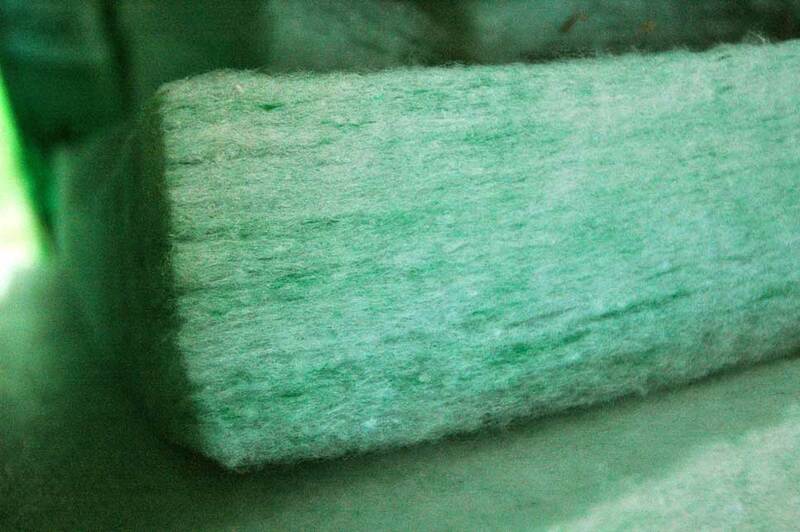 All insulation in the house is Autex's GreenStuf, chosen for its performance and environmental credentials. GreenStuf is made from a minimum of 45% recycled plastic and is bonded using heat rather than chemicals. 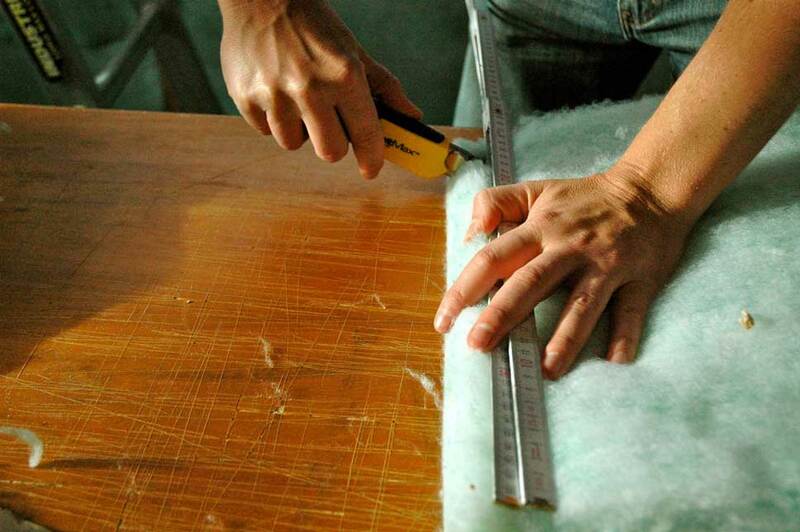 Cutting insulation to size. It's a comfortable product to handle - no gloves required. First layer of insulation in the Eastern wall. The framing solution we've used means two layers could be installed. Showing the double layer of insulation, one of the keys to living without heating. Another shot of the double insulation layer. Jo in charge. It's important to install insulation correctly. Small gaps can reduce performance significantly. Rolled-up GreenStuf next to the recycled boat beams used as support. Completed first layer of insulation in the roof. Second layers of insulation in walls and ceiling. Completed double layers of insulation in upstairs bedroom. The blue insulation in the internal walls is a noise insulation product, also from Autex.